Chocolate Lovers unite! 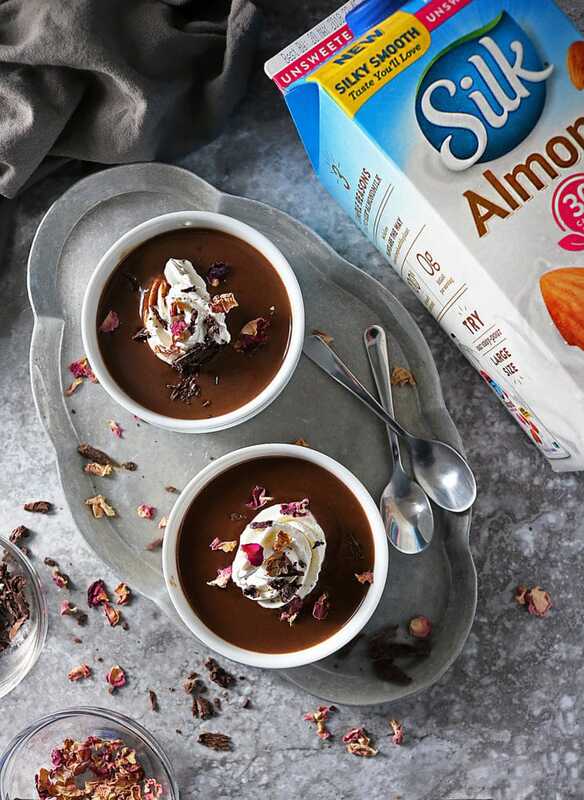 If you are looking for an easy, decadent yet dairy-free, way to indulge your chocolate addiction, you’ve gotta check out this Chocolate Soup! Many moons ago, when my daughter and I used to visit my sister in New York, she would always take us to her favorite bakery in brooklyn. At this bakery, our standing order was a slice of their one-of-a-kind pistachio cake and an iced or hot coffee. On one of our trips there, I noticed another diner have a bowl of what looked like chocolate soup being placed in front of her. Y’all – a WHOLE BOWL of C.H.O.C.O.L.A.T.E. soup! For this chocolate addict lover, ALL that spoonable chocolate goodness had me swooning! When I inquired about it, I was crestfallen to learn that it was chock full of dairy. Being as lactose intolerant as I am, I felt it would behoove me to refrain from it (duh -right?!). Of course, that didn’t stop me from dreaming about that chocolate soup. Over the years, I’ve tried making my own version of it, one of which I even shared on here. But, I always ended up relying on heavy cream and cornstarch to give it that thick, creamy, consistency – and that was one chocolate soup I couldn’t indulge in often. And, when I did, I had to stop after a few spoonfuls. Then recently I came across an article in which someone had used egg yolks to thicken chocolate soup. Now, heavy cream was still one of the listed ingredients, and the egg yolks used were to reduce the amount of cornstarch used, but it got me thinking. 2) one that wouldn’t leave me weighed down. 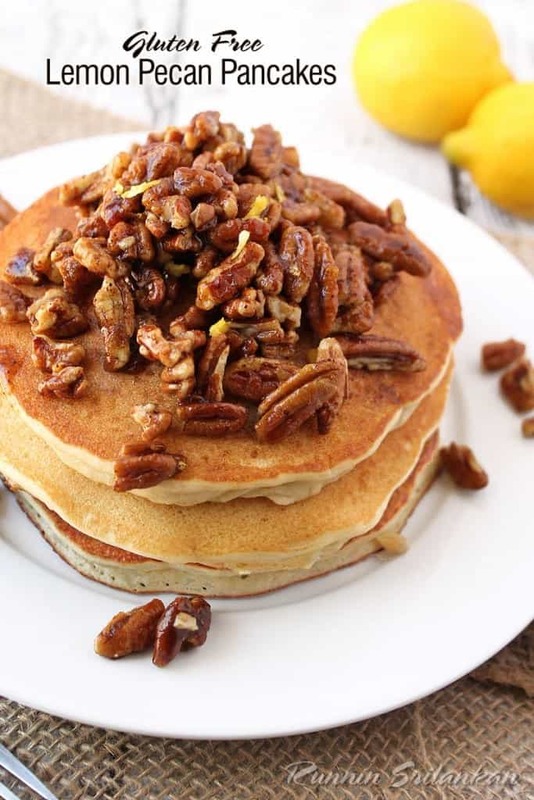 Sometimes, making healthy choices is hard, but feeling healthier doesn’t have to be – right?! 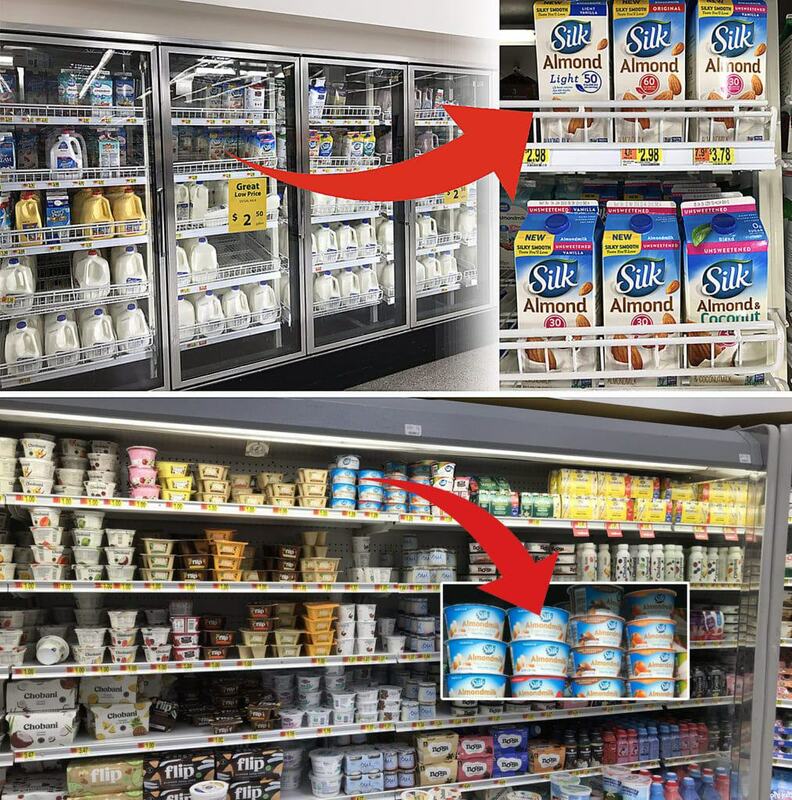 I’ve tried to take a “Less Dairy-More Plants” stance, by stocking up on Silk Unsweetened Almondmilk and Silk Vanilla Almond Dairy-Free Yogurt Alternative at my local Walmart store. I find it hard to be 100% dairy free (like when there’s a slice of cheesecake staring me down at a friend’s house) but Silk fights the notion that “extreme” is the only path to being healthier as small victories are still victories! 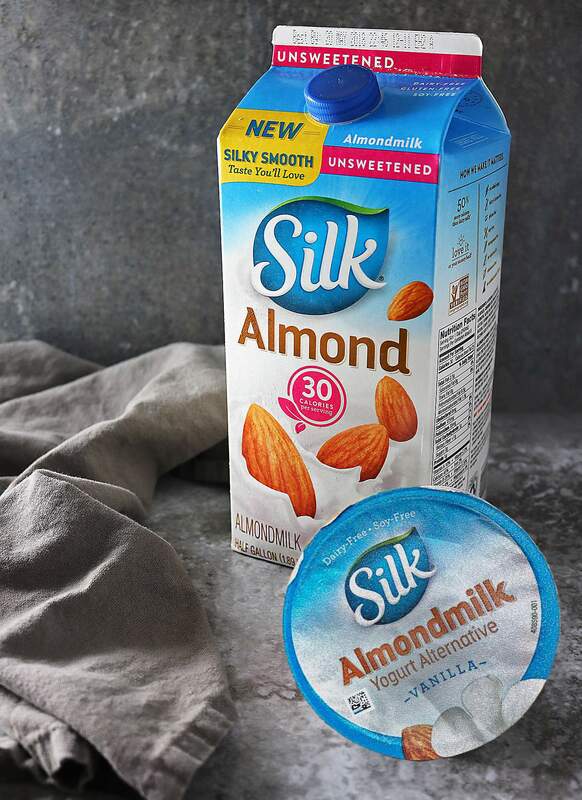 Looking for more ways how you, too, can take a “Less Dairy-More Plants” stance with Silk? Then, check out Silk’s social hub as well as their Facebook, Instagram, Pinterest, Twitter and Youtube channels. Then head on over to Walmart to stock up on your favorite Silk products! Also, if you are using ibotta, here’s an offer you cannot miss! Getting back to this Dairy Free Chocolate Soup, as I mentioned before, it’s made of: Silk Unsweetened Almondmilk + egg yolk + arrowroot powder and it also has some vanilla extract for flavor AND smell! I broke up a good quality, semi sweet baking chocolate bar and used the chunks in this soup too. But, feel free to use milk chocolate or bittersweet chocolate or white chocolate, if you prefer to do so. Hey, in fact, you could use all three and swirl them around for a tri-chocolate soup! Oooh! This chocolate soup is good at room temperature as it’s just too runny warm. Also, when it’s warm, the whipped cream kinda melts right into it. But, if you get a chance to chill this soup for about an hour, it is definitely better than “good”. In my daughter’s words, this Chocolate Soup served chilled is “darn decadent”! 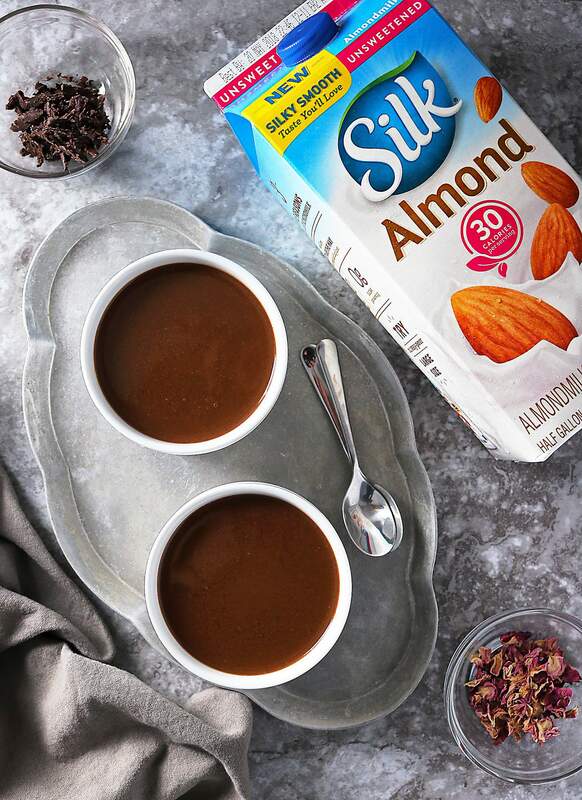 Add the 1 1/4 cup of Silk Unsweetened Almondmilk to a pan over medium heat and bring it to a slight simmer (make sure it's not boiling). While waiting on the mixture to come to that simmering point, take the remaining 1/4 cup of Silk Unsweetened Almondmilk and mix it well with the arrowroot powder. When the Silk Unsweetened Almondmilk begins to simmer, add in the chocolate and stir vigorously till chocolate melts. Then add in the arrowroot mixture and stir well. Then remove from the heat. Now, whisk the egg yolk in another bowl, and as you do so, very, very slowly, trickle in about a half cup of the chocolate soup mixture. This way the egg yolk is slowly tempered with the hot chocolate soup so it doesn't cook and congeal. Then, vigorously mix the hot chocolate + egg yolk mixture in the bowl into the rest of the chocolate soup in the pan. Add in the salt and vanilla extract and stir. Then, pour soup into two bowls and let cool. 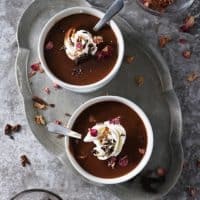 This dairy free chocolate soup can be enjoyed at room temperature - though it's best served after it has chilled for about an hour in the fridge. Spoon on some non-dairy topping or coconut whipped cream and garnish with rose petals, shaved chocolate or nuts and enjoy! was looking for a way to use almond milk. Got your recipe. Thank you! I love this idea! My kids would go crazy if I served chocolate soup. And it looks like it would be a fun entertaining recipe too. 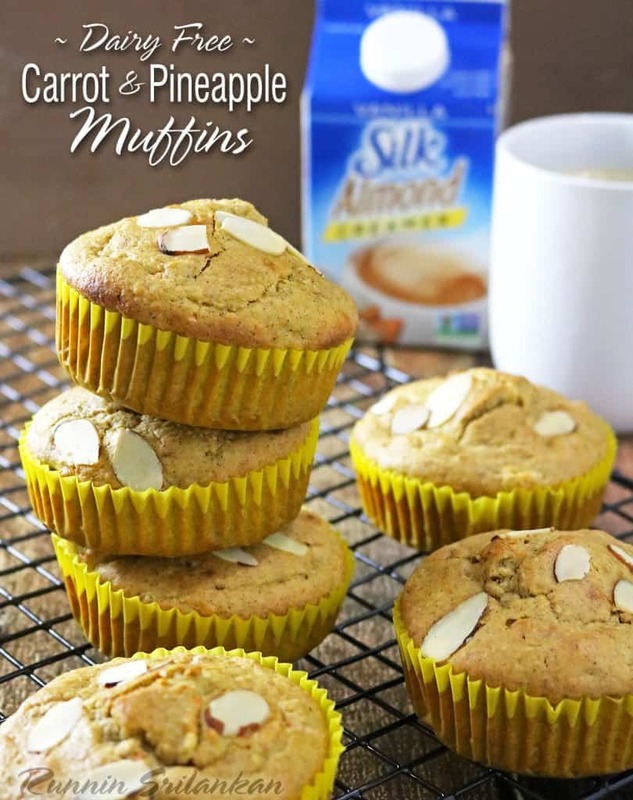 I am always looking for ways to use almond milk. Thanks! I have never tried chocolate soup before, but it looks like such an easy and elegant treat! Making it this week! I love that you call it chocolate soup. We love making dairy free desserts like this too. I have never had chocolate soup before but would never turn down a bowl. 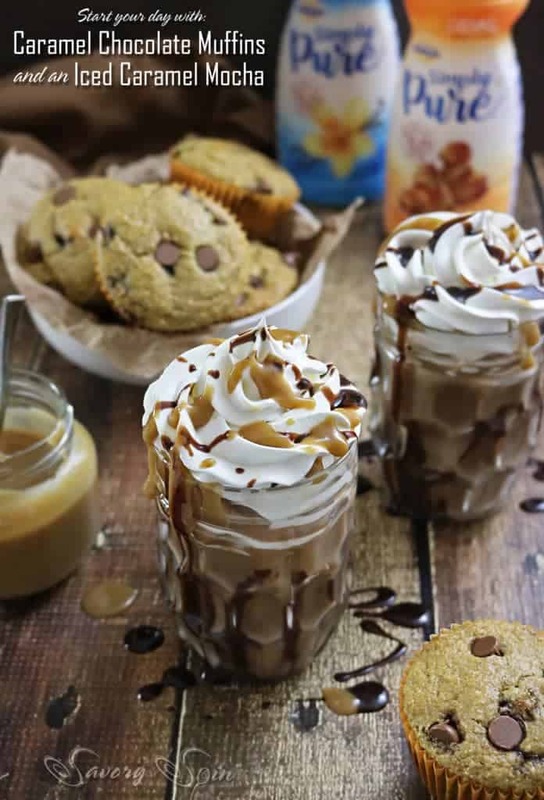 I love the idea of garnishing it with sweet toppings. This is the best soup I’ve seen in ages. Delish! 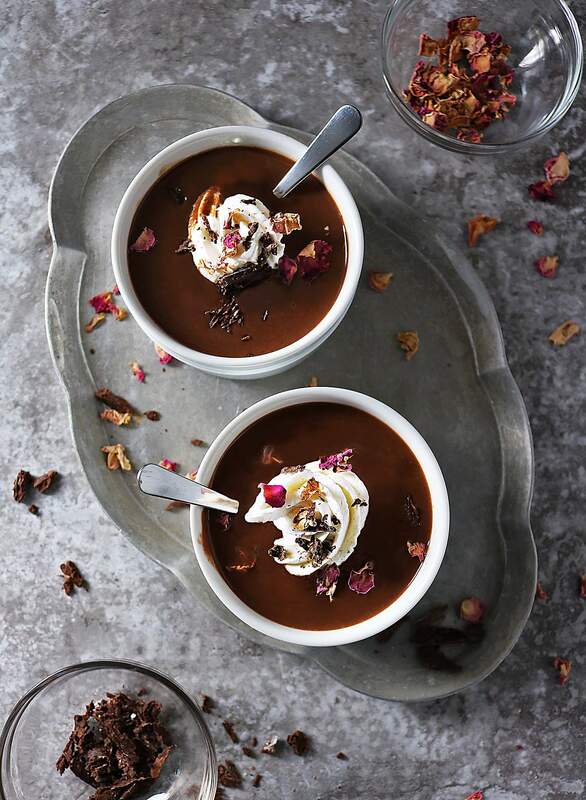 I have never had a chocolate soup…looks amazing! I wasn’t sure whether you ate chocolate soup hot or cold Shashi, but you mention popping it into the fridge to chill before consuming so now I understand. Looks delicious, and my thoughts tell me IT IS delicious! 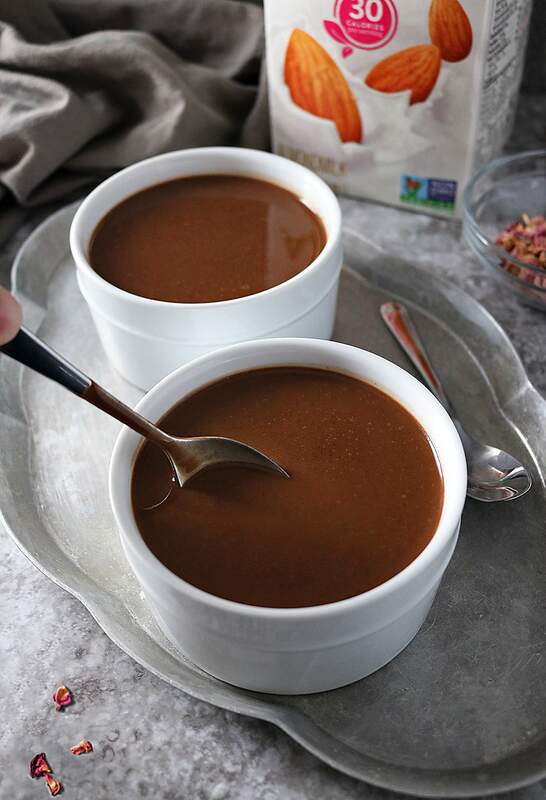 Thanks for putting together this dairy free chocolate soup version. I know this will be popular! Love anything with chocolate! This is a fantastic idea! Love it! Beautiful photos as always! It would be much more helpful I you gave the weight of the chocolate to be used than the measurement in cups. Thanks for the recipe! Hi Marguie – thanks for stopping by! I do apologize for not using the weight measurements – I broke up roughly a bar and a half (approx) of chocolate and used that to measure up a cup and a half. I would love to try but can’t eat egg yolks. Any suggestions. Hi Sally – thanks so much for stopping by! Actually, the first time I made this chocolate soup, I made it without egg yolks – the exact same ingredients minus the egg yolks. It wasn’t as thick or rich-tasting as the version with egg yolks, but it was still good enough that my daughter slurped it out of her bowl without a spoon! GAH – I need to teach her better table manners! 🙂 I sure hope you enjoy this!